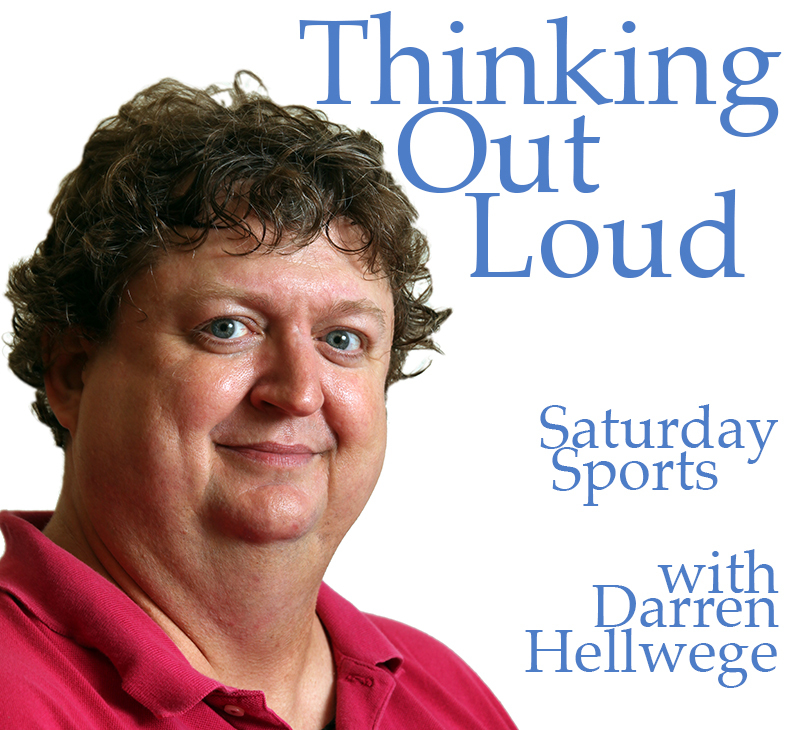 In this excerpt from Thinking Out Loud: Saturday Sports from Aug. 23, 2014, Darren Hellwege talks with David Morrison, the Missouri football beat writer for the Columbia Daily Tribune. 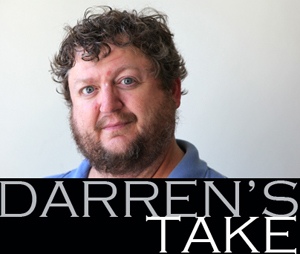 They look back over fall camp and offer a comprehensive preview of the 2014 Tigers, which still has a lot of question marks at a lot of positions. HOOVER, Ala. — Missouri made a surprising run to the top of the Southeastern Conference’s Eastern Division in just its second year in the league. It was a tense and emotional weekend for 15 former Missouri football players as they waited for their name to be called in the NFL Draft. Four players got the call they hoped for. Here are the results from the weekend. Scouts from more than 30 NFL teams, fans and media packed Missouri’s training facilities Thursday to watch the former Tigers defensive end and 14 of his former teammates at the school’s annual pro day. A little over a month since Sam announced his desire to become the first openly gay NFL player, he lifted 225 pounds 19 times, ran the 40-yard dash in an unofficial time of 4.69 seconds and jumped 30 inches — all improvements from his statistics at the NFL combine last month. He also raised eyebrows after tweaking his right hamstring during the run. “Just a little sore,” his agent Joe Barkett said. With television cameras following his every move, the 6-2, 263-pound Sam stretched while teammates performed the 3-cone and short shuttle drills, and returned for the vertical jump and linebacker workouts. One of his fans in attendance was Jets defensive tackle Sheldon Richardson, who left Missouri last year. Richardson wished him the best in the NFL but said the draft hopeful could wind up hearing some homophobic jokes in the pros. Sam is pegged to be picked in the lower rounds of the NFL draft, if at all, much lower than fellow defensive end Kony Ealy. On his second and final attempt, Ealy ran the 40-yard dash in an unofficial 4.57 seconds, only four-hundredths of a second slower than Jadeveon Clowney’s time at the combine. The school announced the time, which would be a considerable improvement over the 4.92 seconds Ealy posted at the combine. Ealy also posted a 32-inch vertical jump and a 10-foot broad jump. Ealy hopes to become the seventh first-round NFL draft pick from Missouri in the past six years following Richardson last April. The 6-feet-4-inch, 265-pound end described Richardson as a mentor. While much of the attention surrounded the two defensive ends, the workouts gave other players a chance to show off their skills in front of scouts from every team except the Redskins, according to the NFL Network. Franklin ran an unofficial 4.9-second 40-yard dash on his second attempt, while receiver L’Damian Washington paced the field with an unofficial 4.39-second mark. Washington hopes the injury won’t prevent him from fulfilling his dreams of becoming an NFL player. 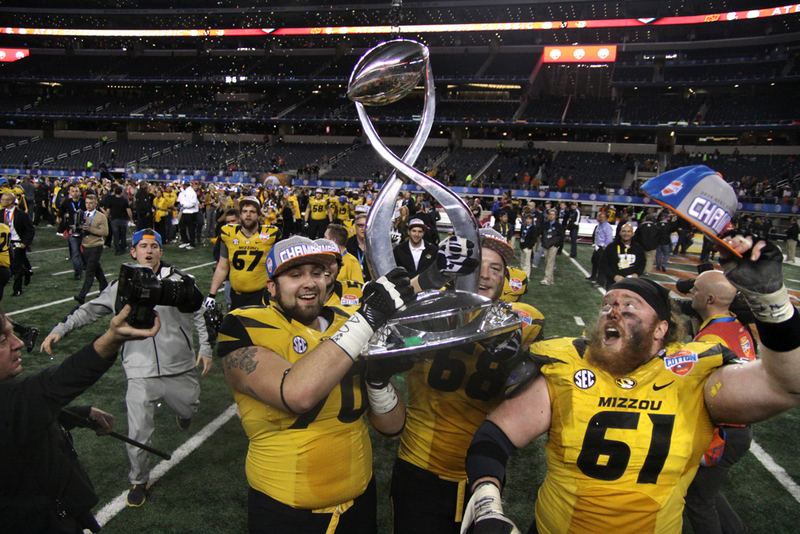 Anthony Gatti (70), Justin Britt (68) and Max Copeland (61) celebrate on the field with the Cotton Bowl trophy after the game. ARLINGTON, Texas — Missouri got the big plays it needed at the end of the Cotton Bowl to beat an old rival. Henry Josey ran for 92 yards and three touchdowns, the last a 16-yarder with 3:08 left, and Shane Ray returned a fumble 73 yards for a touchdown after that as the No. 9 Tigers beat No. 13 Oklahoma State 41-31 late Friday night. Missouri got off to a slow start in the first quarter of the Cotton Bowl but was able to go into halftime with the lead over Oklahoma State. The Missouri Tigers prepare to run onto the field for the Cotton Bowl game. Bud Sasser (21) looks to get a pass interference call. Dorial Green-Beckham misses a pass in the first quarter. Marcus Lucas celebrates after scoring a touchdown. Marcus Lucas stretches to try to make a reception. Bud Sasser (21) goes up for the pass, tightly guarded by an Oklahoma State defender. James Franklin struggled to be effective in the first quarter. This pass is just out of reach for Dorial Green-Beckham. Quarterback James Franklin, left, is sacked in the first half. Quarterback Maty Mauk (7) scrambles out of the pocket for a first down. A fan wearing a pod of cotton on his head. ARLINGTON, Texas — Missouri coach Gary Pinkel is constantly asked to compare the SEC to the Big 12. The ninth-ranked Tigers left the Big 12 two years ago, got off to a rocky start but won the Southeastern Conference East Division this season in somewhat of a surprise. After failing to make it to a bowl game last season, football coach Gary Pinkel led the Missouri Tigers to a Southeastern Conference East Division championship and a spot in today’s Cotton Bowl. Since coming to Missouri in 2001, Pinkel has taken the Tigers to nine bowl games. Here’s a look at Missouri’s bowl game record. IRVING, Texas —Missouri quarterback James Franklin remembers exactly what happened the only time he faced Oklahoma State when the two teams were still Big 12 rivals two years ago. Franklin gets another chance against the Cowboys in his final college game. The No. 9 Tigers (11-2), the Southeastern Conference East champion in their second season in the league, play No. 13 Oklahoma State (10-2) in the Cotton Bowl on Friday night at 7 p.m.
Cowboys linebacker Shawn Lewis, who had one of the interceptions in 2011, admits that it “does add a little flair to the situation” with Missouri having come from the Big 12 and now having success in the SEC. “We have a bunch of these guys, all my seniors were playing, and their guys were playing, Franklin and Josey and the senior offensive line, they were all sophomores. They were pretty good on offense, and we were pretty good on defense,” Oklahoma State defensive coordinator Glenn Spencer said. “I think it’s a good dynamic of this game, from that side of the ball, and my side of the ball. We’ve all gotten better. Let’s see what happens.